Perfect for small offices and conference rooms, this brewing system will be a big hit with employees and guests. Designed for offices in the small-to-medium range, this feature-rich brewing system will satisfy all your employees’ coffee, tea, hot cocoa or iced beverage preferences. Available in pour over or plumbed to water models. The B150 Brewing System brews a perfect cup of coffee, tea, hot cocoa or iced beverage in under one minute at the touch of a button. Now everyone in your office can brew what they love. This fully programmable brewer has an interactive touchscreen that allows you to program the brew temperature, Auto On/Off and set your language preference to English, Spanish or French. The B150 brewer has a choice of five cup sizes, and offers a removable drip tray to accommodate travel mugs. 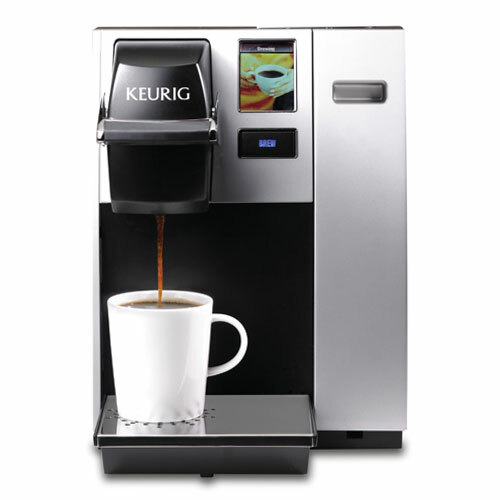 Keurig’s premier model is packed with features that provide the utmost convenience for your large office. The B3000SE Brewing System brews a perfect cup of coffee, tea, hot cocoa or iced beverage in under one minute at the touch of a button. Now everyone in your office can brew what they love. This brewer has an LCD Interface that provides step-by-step brewing instructions in English, Spanish and French and a choice of four cup sizes. The drip tray flips up to accommodate travel mugs and K-Cups are automatically ejected after each brew.